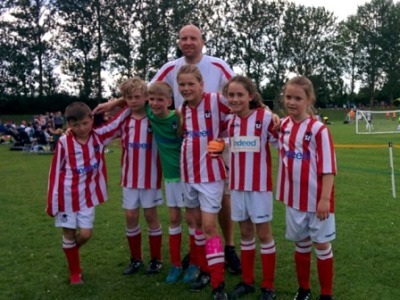 A great day at the Buntingford tournament for our 2 U9 teams, read our story that took us from 12 to 11 to 10 to 9 players… by the end there were some very tired legs…super proud, well done all!!! The Reds had a very impressive tournament, with one win and two draws, and several other very close games. The players should be very proud of their achievement – they all put in well over 100% in very hot conditions. The first game was against Pansanger, who were clearly a very strong team (and in fact went on to win the group). The Reds were more than a match for them for all but the last few moments of the match. We did struggle to get out of our half for the first part of the match, with Henry doing a good job in goal, but soon we were taking shots at goal as well. The match saw Felix make his debut for Ashwell Accies, and he showed good skills today in tackling as well as running forward – thanks very much to Felix for being a last minute stand in – really appreciated. Finn in particular was playing really well, winning every tackle, and making every pass – but then disaster struck with only seconds left in the game when he sprained his ankle in a tackle in our penalty area, which unfortunately ended his tournament. Hope you get better soon Finn. As we sorted ourselves out following the substitution the opposition managed to sneak a goal right at the end. The second match was against Chorleywood. Olivia did a sterling job in goal, keeping the Red’s only clean sheet of the day – well done! After having his radar honed slightly after the first match, Thomas found the mark in this game for his first goal, and Ashwell won 1 – 0. The third game was against Bedwell, who we have played several times already this season, often in close games that have just gone Bedwell’s way. This time however the Reds were not going to let a close game slip away. George M was calm and confident in goal, making several good saves. Olivia and Henry were strong in defence, and Felix took a run in midfield making a couple of good chances. Despite going 1 – 0 down fairly early in the game, a goal from Thomas pulled things back to a 1 – 1 draw at the end. 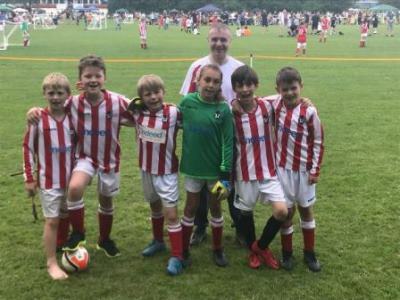 The fourth match was also against a known opposition – Buntingford the tournament hosts, who put out a very strong side. With Thomas in goal we tried some long ball goal kick tactics, and, to the dismay of the opposition coach, George M neatly controlled one and slotted it into the back of the net to put us ahead. Felix also had his first turn in goal, and the whole team all worked really hard. However, Buntingford managed to get 3 goals and ran out the winners. The final group game was against Royston. The Reds pulled up their socks after the last match and set to work. Henry had a strong game in defence, making good tackles and confident clearances. In goal, Olivia was doing a good job and again on course to keep a clean sheet, but unfortunately the referee awarded a penalty against Ashwell, and we went 1 – 0 down. The Reds were determined to get back level, and a long pass from Thomas found George M on a strong forward run, and George struck home for his second goal of the tournament. The Reds were down to four players for the knock-out game against Stevenage Jaguars, but I was really impressed with how they all played. Henry made a super save in goal, and also made good goal kicks. Olivia made an endless series of impressive tackles and clearances. George M worked hard as the lone player up-front, nearly catching the opposition out on several occasions. Thomas did his best with shots from our half, one not far off the top corner. We were 3 – 0 down fairly soon in the game, but then held our own very well and when Thomas had scored following a long run from our half, the game didn’t look completely finished. However, in the end it was 4 – 1 – but a really impressive end to the tournament for the Reds (cheered on by Finn). The Reds worked together as a team not just on the pitch – off the pitch today they worked together to make decisions about positions and tactics. Very impressive to see them take that responsibility. A really good team effort by everyone, and bring on the next tournament! I don’t mind admitting a few jitters the night before, I really wanted them to do well, last year was really tough…..pah shouldn’t have worried, go Whites!!! The Whites had a hard fought and great tournament, with one win and a draw and several other very close games. The players (Francesca, Beatrice, Joseph, Charlie, George R and Billie) all played brilliantly despite the hot day and difficult circumstances. Our first match was a tense affair with quite a few shots both ends, it was end to end stuff and by 10 minutes of the 12 in the coach was a nervous wreck. Some good saves from George R and great link up play from the outfield kept us in a really competitive match which ended 0-0. Nerves managed, a really good start. Second match, we were truly magnificent and still with 6 players intact from goalkeeper to upfront every player did their bit in particular Charlie was our defender as solid as a brick wall. Two goals from Bea and Billie give us a 2-0 win. Third match, our goalkeeper is really starting to struggle a huge blister on his foot looking particularly nasty… he carries on for another match and makes several outstanding saves. We are up against one of the top two teams in the group and the score line of 3-0 to the opposition is a bit harsh on us having had a few shots go just wide or saved by the keeper, we can’t feel bad we are playing great and Bea is just rocking the midfield (a real talisman for the team all day long). Fourth match we have lost our keeper, he is in real pain and off to hospital, we are a bit worried about him but we take to the field, Joseph steps up and takes the keepers shirt, we only have 5 and the opposition has 8 players. Against adversity this team keep going, Charlie some magnificent tackles, Joseph makes several Important collects and saves. Francesca makes several good runs as does Billie and eventually 1-0 down we get a free kick with about 10 seconds left. Bea took a great free kick and the goal keeper just gets his hands on it, it’s a really close match and we are looking a bit tired… we lose 1-0 but we’ve a lot to be proud of. 15 minutes later…..not ideal we go up against the top side, they’ve scored a barrel full of goals against everyone and we look heavy legged. We huddle and we play our hearts out, it’s just such a proud moment when the players put every ounce of what they have left into something. We defend for much of the match , if we’d laid down we’d of lost by 7 or 8 , we didn’t (Charlie even playing through a hard ball to the face) we keep it close and it’s only 3-0 at the close. Our players look very tired, Bea, Francesca, Billie and Charlie have put in some serious yards. We end 5th in our group, importantly we have progressed, we have been hugely competitive and we were not far off 4th spot… so to the knockouts… hmmmmm we’ve just worked out we have to play the top of the group a second time…. honestly we all groan a bit. We rest up for 15 minutes and it takes a bit for us all to get up and take the field, we are now officially exhausted. The knockout, those jitters have returned, the opposition coach even feels for us, he knows he has fresh legs… we kick off and within the first 4 minutes Francesca has taken a ball to the stomach. Bravely she stays on but is knocked sideways a bit. We do a lot of defending but boy do we defend, they get a goal about halfway through but it takes from then until the final couple of minutes to get a second, they win 2-0, it feels good to have put up such a fantastic fight, at 1-0 their coach admitting to being very nervous and complimented our 5 on such a great display. We (myself and my wonderful supporters clap the team off the pitch). It’s a little emotional, it’s the last time Francesca will take the field for the Accies. Bea gets my award for talisman of the day, simply outstanding, Joseph for great midfield play and stepping up to take on goalie (brill stuff), Billie for a second goal and running further than she thought she could, Charlie was awesome in defence all day, Francesca toiled really hard up front and my injured keeper George R needs special mention for such a brave and great performance. Well done every player. Coaches exhausted head home for an early night, well done all the players and thank you so much to the supporters. 12-11-10-9 players, who cares we are the ACCIES!!!!! !